Let’s be completely honest here. The 2017 KTM 350 SX-F isn’t a whole lot different on the spec sheet when compared to the 2016 model. The engine is very much the same package with some electronics changes and KTM’s new ‘traction control’ feature added. The chassis is almost identical to what we saw in 2016, with the only real difference being new engine support mounts. There are some changes to the Brembo brakes, with a less aggressive style of brake pad and a longer rear brake pedal. KTM engineers re-worked the design of their CNC machined triple clamps in conjunction with their new fork tubes, which really means they changed the design of the clamps to allow them to flex differently. The big news, as we just alluded to, is in the front suspension, with major changes in the way of a brand new set of forks, the WP AER fork, which is the latest in air suspension technology from the folks at WP Suspension. The WP AER system is a separate function fork, with compressed air acting as a spring in the left side, while a more conventional oil and shims set-up doing the damping work in the right side fork. Air is adjustable through a valve on the top of the fork, which the WP air fork pump screws right onto. The pump is provided by KTM with the sale of every new bike and displays a nice digital face for all us tinkerers out there to play with. The other fork is similar to your average cartridge fork, but without the spring. Of course, the WP rear shock gets some minor changes too with internal valving changes to match the new fork and chassis changes. Lastly, bold new graphics and changes to the plastics colour scheme give the KTM a fresh new look. Gotta give the kids something to talk about, right? Sure, the ‘all-new’ list ends here, but in our opinion that’s a good thing. After all, don’t forget that the 2016 model was ‘all-new’ too. You’d be a bit worried if after only 12 months KTM were having another go at the 350 SX-F.
2017 KTM 350 SX-F in all its glory. 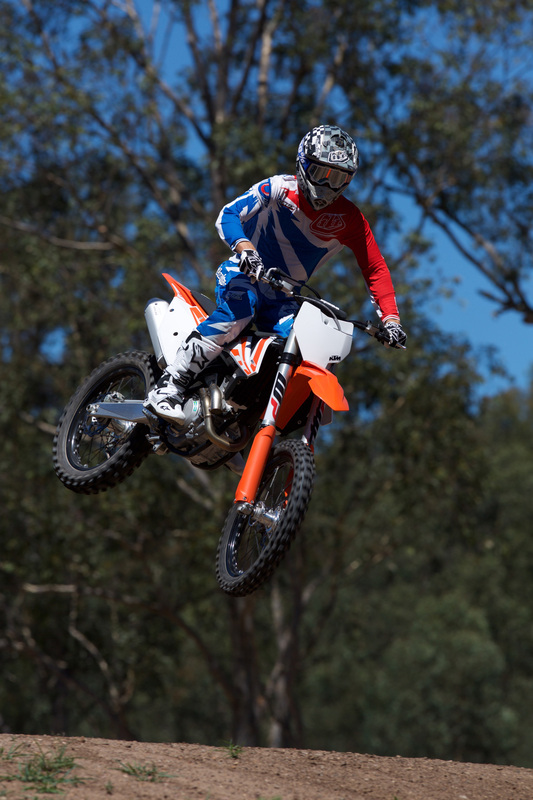 The traction control system, and electronic upgrades going on with the 350 SX-F, and the rest of the KTM four-stroke MXers for that matter, are certainly pushing the boundaries of dirt bike technology. Wheel sensors are non-existent, as they are illegal in motocross racing. Instead the traction control system monitors RPM, throttle position, and many other engine behaviours to ‘tune’ the bike on the run. 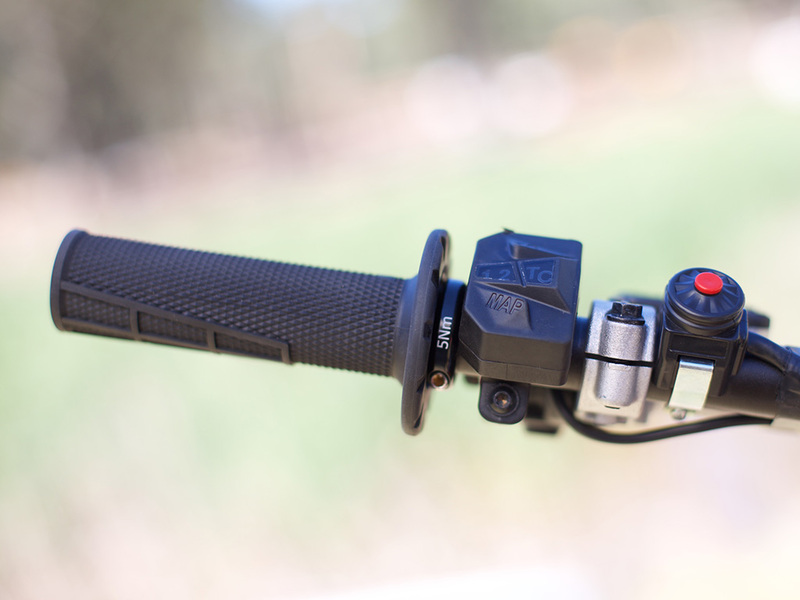 This system is fitted as standard equipment, and is activated by the rider by using a button on the handlebars. Right next to the traction control button, is a mapping button. The mapping button, activates or deactivates a more aggressive style power curve. KTM has used this feature on and off over the years, with some models featuring it, and some not. It’s nice to see it return on the 2017 model, as it’s a feature that most riders will get a lot of use out of. While on the topic of electronics, KTM are still the only motocross bike to come standard with an electric starting system. 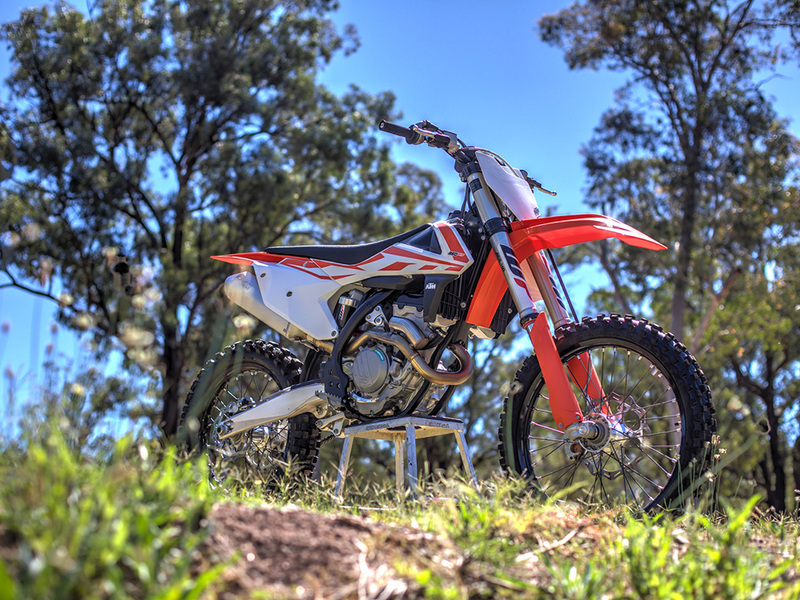 The system has been on the KTM thumpers for a while now and has proved to be very effective and reliable. It’s actually pretty crazy when you think about it, here we are talking about traction control and advanced electronics but yet all of the KTM’s $12,000 competitors, except Husqvarna, come with a clunky old kick-starter. You know who makes Husqvarna’s right? Traction control and throttle maps on the left switchblock. The 350cc engine concept may seem a bit odd to some, but to those who have ridden it, it makes perfect sense. Take a bit of punch away from the 450, and make it rev almost as far as a 250F. 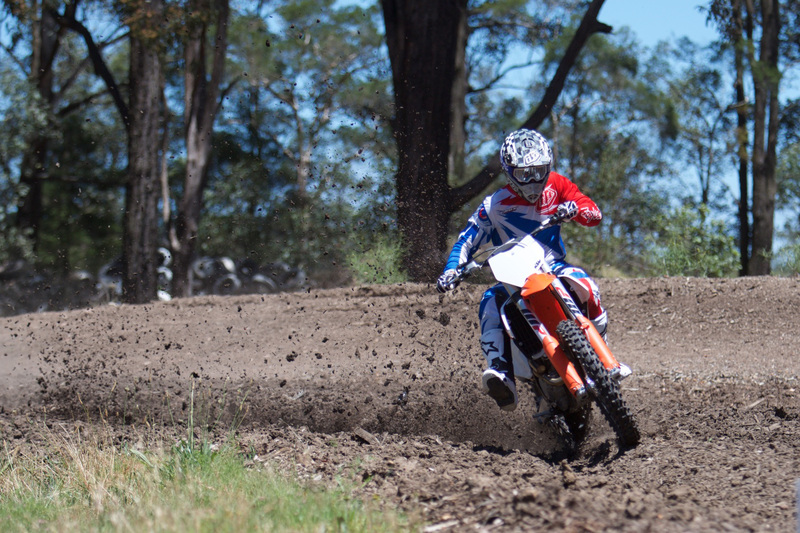 It’s very potent recipe that is so much fun to ride on your average motocross track. The engine lights up quickly, with it’s fast, free-revving style that responds quickly to a bit of clutch and a whisky right hand. It’s not super strong in any one area, but if you can keep the revs up, the mid to upper RPMs will reward you. There’s no chance you’ll be wiping the smile off your face. The traction control system works surprisingly well in slippery conditions. On day-one of our test, we were greeted by a very dry and dusty motocross track. With the traction control on, it felt like we still had full power but at the point where you would normally have the bike launch into wheelspin or step out sideways on the exit of a corner, the KTM traction system kicked in just enough to calm the party down and keep things moving forwards. The mapping system, like the traction system works very well as the aggressive mode certainly packs a bit more punch. We still preferred the standard mode in the conditions we rode, as we felt like it offered better overall power around the whole track. 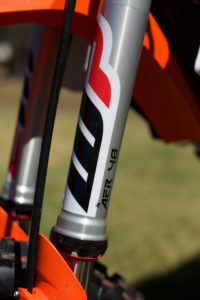 WP AER 48 seprate-function air fork. Now the part all the KTM die-hards have been waiting to hear about. The new WP AER front suspension. KTM set 10.6-bar of pressure in the left fork, which is the showroom floor setting. Our two test riders are around the 80kg mark, and after only a few laps both found the KTM to be a bit stiff on initial feel. After talking to the KTM Australia technicians, they were quick to tell us that at our size and speed, setting it between 9.2 and 9.6 bar should be right on the money. We also backed the rear shock sag off to around 105mm and softened the rear clickers up a bit and we would be fine. Once adjusted, the AER fork was much better, and it gave the 350 a very consistent feel throughout the day. The performance of the forks was quite good, with it being precise and predictable all day long during our two test days. The air pressure stayed very consistent and we never had to adjust the pressure due to loss or heat. Eventually we were happiest with 9.6-bar in the front fork and felt like this is a set up we could be very confident with. The rear shock worked well and complimented the new forks, with no harshness and great stability at speed. The overall handling of the 350 SX-F is great, as you would expect the lighter weight and lower rotating mass of the 350 make the bike easier to steer around the track, allowing you to be more precise and not become as worn out doing so. It’s no secret we are big fans of the KTM 350 SX-F, and the 2017 model is a huge improvement over what we’ve ridden in years past. 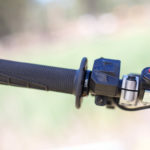 The WP AER front fork makes the world of difference when it comes to comfort and handling, and as mentioned above we would rate it the best production air fork we’ve ridden to date. The engine is so much fun to ride, it can be ridden easily right throughout the rev range by riders of all skill levels. It doesn’t pack the punch of a 450 on the open fast tracks, but for most of us mortals it’s less taxing and is easier to ride when the track starts to get a bit beat up.